We are delighted to be able to announce the new, 30 Note Music Box Set. Our large music box set is able to play 20 notes, which gives it a range of two and a half octaves. However it can only play the diatonic or 'white note scale'. This new music box has a range of just over 3 octaves, but in addition it plays a scale that is mostly chromatic. This expands the musical possibilities enormously, since this new music box can now play sharps and flats. As a little experiment, we programmed in Chopin's Prelude in A, Opus 28 no. 7, which would not have been possible without the availability of sharps and flats. 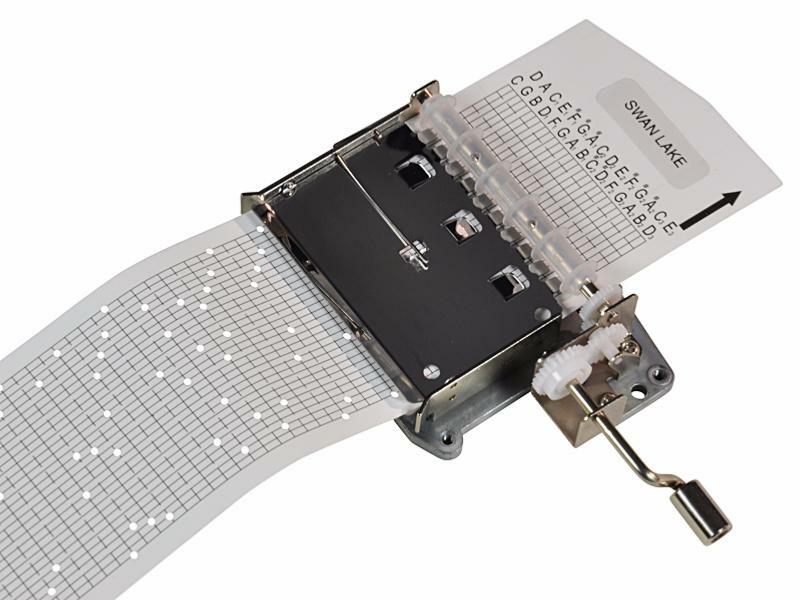 You can see Tim playing this in the video.The new music box takes paper strips that are physically the same size as those used in the large music box set. However they have been printed differently, due to the availability of the extra notes. The 30 Note Music Box Set comes in a plain white box. Inside the box is the Music Box itself, one pre punched strip which plays the theme from Swan Lake, one blank strip, and a hole punch.The Music Box weighs 280 grams, and is 108 mm wide (150 mm wide including the handle), 70 mm deep, and 30 mm high. When packed in the box, with the hole punch and blank strips, the weight is just over 400 grams.There is an important point to make, if you are planning to combine the music box with other instruments. The notes that are marked on the paper strip, ie G, A, C, are NOT the notes that the music box actually plays, if you compare it with the notes on a piano. 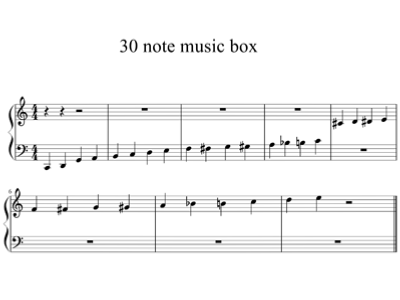 So the line marked F# on the music box plays back as a B, G# plays as a C#, etc. As well as a fun way to learn about music, there are also some serious musicians out there who are using the music box, including Hannah Peel. There is also an app that has been written that allows you to test out new songs and compositions, and when you are happy with the result, you can print out a guide to help you punch out the paper strip. Correct item and packaged well. The strip that came with it didn't seem to work and tried repunching the holes but still not quite right. Don't have time to make my own strip but it still is a very neat item. Great fun! Very decent music box and hole puncher to create your own melodies. This music box is fascinating. My son is a music composition major in college and can't wait to compose some music with it. Fast shipping. Product as described. Would buy from again! It would be helpful to know the exact notes you can play on the music box as we didn't have all the notes we needed as there is a big gap at the bottom range. It was for my 18 yr old who has Asperger Syndrome. He loves music and I love listening to what he creates!